Fourteen-year-old Aleister Lister Smith is sailing through a peaceful existence at a respectable public school in Shropshire. Perhaps too peaceful, even a bit boring at times. The only adventures in his life are the ones he reads about in books like The Count of Monte Cristo. But all that changes one day when the mysterious brother-in-law of his schoolmaster shows up. What are these troubles that the brother-in-law is undergoing, and why does he want Aleister to help him with them? Before he knows what’s happening Aleister finds himself on the way to Manchester, ostensibly to work as a clerk in an insurance office, but really to try to find out the identity of a blackmailer. Complicating his life once he gets there is a young girl named Kate who quotes Paradise Lost and seems alarmingly lively. Then there is Jack, his co-worker, who sneaks out during work to smoke. It all seems quite a different world from peaceful Shropshire. And then on Guy Fawkes Night, there’s a murder. 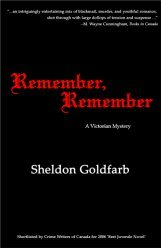 “… Sheldon Goldfarb’s doctorate in Victorian literature, his life-long interest in history and his previous publications on William Makepeace Thackeray have served him extremely well for his debut young adult historical mystery novel, *Remember, Remember*. His story is an intriguingly entertaining mix of blackmail, murder, and youthful romance, shot through with large dollops of tension and suspense, and set in an age in England when the East India Co. was still an economic force to be reckoned with, the Darwin-Huxley debates over evolution were to be listened to, aggressive young women shouldering their way into the workforce as typing machine operators were to be wondered about, and public boarding school lads like 14-year-old Aleister Lister Smith were to be reprimanded for secretly reading *The Count of Monte Cristo*, or even worse, for participating in Guy Fawkes Day celebrations.